UPDATE April 15, 2010: Note that US natal Uranus 8Gem55 is rising with its revolution/rebellion tendencies and sudden disruptions. There are more factors to mention in this sad chart than there’s time for this morning, but I’ll try because today is the 13th anniversary of the day of horror in Oklahoma. 9:02 am cdt–Hour of the Moon–changes, instability, publicity; no out-of-bounds planets so all the actors are in sync, and there’s a Hard Rectangle of antagonism and aggression overhead. Charles Jayne named the configuration ‘Hard Rectangle’ and I’ve highlighted it in green for you. It contains two oppositions whose ends are both semi-square and sesqui-square one another, both of which are minor aspects of nagging irritability. The Hard Rectangle pattern triggers the opposition to act with more drive than it otherwise would – the added tension shows antagonism and a lack of compromise with others – on all sides. (Tierney). There’s a “hidden square” (256 degr) between violent Mars, the activist and instigator (at IC, the Foundation Point) and secretive saboteur Pluto at “1Sag”…”A Grand Army of the Republic Campfire” degree. Hmmm…was a ‘secret hand’ (Pluto) involved? Pluto also is a significator of the underworld, aka organized crime syndicates. As you know, a Mars/Pluto square can be overly aggressive, reckless, foolish, and abusive…and angry. 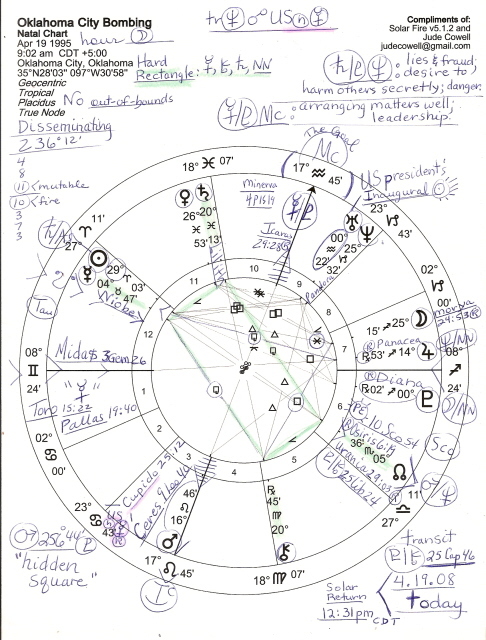 Mercury (young people) is conjunct South Node (SN = separation) and asteroid, Niobe, “the grieving mother” in the karmic, behind-the-scenes 12th house which shows the poor little children in the Murrah Building’s daycare center. Did they die for politics and misdirected ideals? How cruel and obscene is that? You see that Uranus and Neptune are a bit beyond their Great Conjunction of 1993 (the NWO pair) with Uranus conjunct US Inaugural Sun (Jan 20th, noon, 00AQ+) So rebellious Uranus meets US leadership (Sun = POTUS) and the president may act in ways that are uncharacteristic. Needless to say, obscuring, deceptive Neptune will go on to conjunct the 00AQ+ degree as well, a time when inspirations are misguided and there may be a Neptunian veil thrown over the identity. 00AQ+ is the degree of all US Inaugural Suns, btw (Jan 20)…Sun in a national chart = the leader; in America’s case, the president. Plus, Uranus to US Sun, as we have here, is an ego-awakening time of restlessness and finding a new identity or a new way to gratify the ego. If you remember the shock of this bombing–possibly a false flag op upon America–you know it shook our sense of identity in similar fashion to the Siege at Waco, Texas (Feb 28, 1993) which also had technological implications mixed with fraud and deceit. leadership; great perception of any situation; resourcefulness; coping ability; keen judgment; foresight; the ability to arrange matters well. Another hmmm…depends on who is doing the arranging and coping and for what reason. One thing we know: violence was used. I’m thinking of the first two years of Bill Clinton’s presidency – before and AFTER this attack….just as I do of 9/11 and the Bush-Cheney change of identity afterwards. Prior to the attacks of 9/11, things weren’t going so well for the GOP’s unstable coup of the White House, nor for SCOTUS’ reputation because of their primary part in the Bush-Cheney coronation (and that of then-Florida-governor Jeb, George’s brother). Saturn/Pluto = Neptune: lies and fraud; desire to harm others secretly; danger; unstable life situation because of the inexplicable, because of fear; being doubted, not being seen for who one is; immorality; danger (Ebertin). Does this important picture describe McVeigh and Nichols – or someone with even more to lose and something incriminating to hide? They sure executed McVeigh in a hurry, didn’t they? Allegedly. One more thing I’ll add for now: transit Neptune of deception and illusion fame is in process of opposing the US natal Mercury in Cancer, a period when misunderstandings and frustrations increase especially in regard to Facts and Figures. Accurate records of sales and business dealings are subject to error, deception, and loss, and fanatic ideas and ideals may enter the environment. Others may point out inaccuracies, mistakes and delusions–quite an inconvenient time for the dishonest among us, wasn’t it? Specialized skills end up not filling the bill and dependable people tend to disappear under this transit. Well, I must disappear for now, so let me know if you have queries or comments about this chart, okay?